This exciting Halloween treasure hunt is for kids aged 4-6 or 7-10. Somewhere at Count Gregor's faraway home, Hertzog Castle lies a hidden treasure but it is guarded by the castle's many creepy inhabitants: Mystic Mathilda, Wizard Wizzicus, Frankenstein's monster, Count Gregor's relative from Transylvania and many more. In order to find the treasure, curious puzzles and interesting challenges must be completed! In the treasure hunt package, you get everything you need to organise a seriously fun Halloween Adventure for the kids. Just print out the file and set it up. You create the treasure hunt using the easy-to-follow game plan. With the help of our guide, you choose the hiding places, clues and challenges and then arrange them for the children to find and solve. The treasure hunt can be played in any home, inside or outside. The puzzles and challenges are tailored for both age groups and are appropriately difficult. The treasure is in a secret chamber that must be unlocked by six keys. Each time the children defeat a monster or solve a puzzle, they get a key card until they reach the treasure. 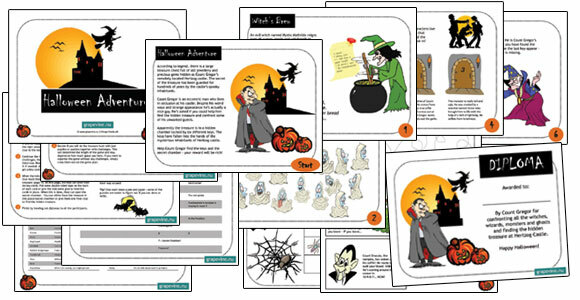 Easy to organise for you - super fun and suitably scary for the kids! Order the Halloween Adventure by clicking on the 'order' button below, you pay safely with a bank or credit card, the treasure hunt is delivered to your email immediately. The Halloween Adventure is adapted for children in two age groups. This game is intended for children aged 4-6.